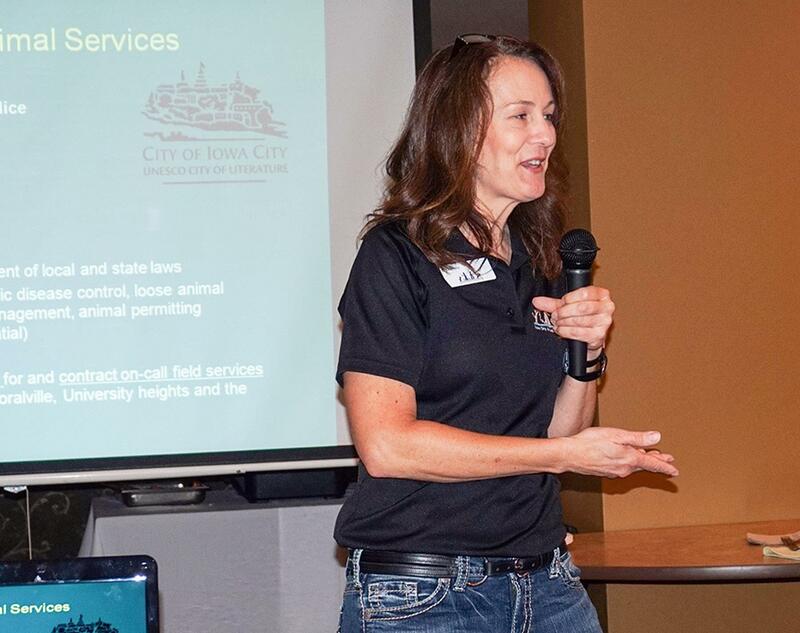 Rotary File for August 2, 2016 | Rotary Club of Iowa City A.M.
Liz Ford, Director, Iowa City Animal Care and Adoption Center was the speaker. Deb Dunkhase has returned from Guatamala and led the August 2 meeting. She reminded the group of the next Rotary Leadership Institute to take place August 27 in Iowa City. She also said that the final results of the Food Fight were being tallied, but she is expectant that AM Rotary will win the Turkey Trophy as the champion Food Fighters. IA MOST sold 700 lbs of salmon for its fundraiser and has distributed all of the orders. We will sample some of it during breakfast next week. It is wonderful! Deb Ockenfels invited everyone to participate in the fleece cutting event on Friday, Aug. 5, 3 pm at the Ockenfels hangar at the IC Airport. The scarves being cut will go to Guatamala with the IA MOST team. Tom Langenfeld was a Rotarian in the News this past week. Many happy Rotarians: Pat Schnack for her radiation treatment completion and for the support we give Meals on Wheels. She reminded us that there is a new Meals pick up point at Elder Services on 1st Ave. on the East side of town. Karin Franklin was happy about her time in Guatamala, as were Deb Dunkhase and Nancy Pacha. John Ockenfels had an adventure in living on cash rather than credit at the Oshkosh Fly-in. Jack Tank had a good time visiting with his mother. Deb PVA enjoyed the pie contest at the County Fair. Amy Nicholson had a great trip to Belgium, Netherlands and Germany with her daughter. Brian Adamec enjoyed his first Month Opener. Peggy Doerge will be moved in to a new home on N. 7th Ave. by this time next week. Phil Peterson house-sat in San Francisco for a relative who was on a mission in Madagascar. Mark Patton visited Lake Placid for a family wedding. Deb and Kris Ockenfels enjoyed surprising John with a new decoration on the hangar walls and was pleased that John's parents are doing better after some health issues. Nenu was thankful for help she received moving furniture. Deb D. is simply happy to be an AM Rotarian. Karin Franklin introduced Liz Ford from the Iowa City Animal Care and Adoption Center. Ford started off as a volunteer and a director of the Foundation that supports the Animal Care Center. In 2011 she became a Technician at the Care Center and later became its director. The Center is a division within the IC Police Department and its main function is to enforce laws pertaining to domestic and wild animals within the City. The surrounding cities and the county have agreements with the Center for some services, but only Iowa City residents receive full service such as to pick up stray animals or assist in capture and release of trapped wild animals, etc. The Center will investigate abuse cases, issue permits, investigate charges of excessive animal noise and bite incidents. The Center does lots of education to help prevent dog bites of young children and to help families provide better care and training to their pets in an effort to see fewer abandoned animals in the city. They provide intake and reclaiming services for lost pets, and they provide adoption and foster care services for abandoned and surrendered pets. About 80% of the animals waiting for adoption are cats and the rest are dogs, ferrets and other types of pets. 1989 animal intakes-- this number is on course to be 2500 for 2016! Right now there are about 200 animals in the care of the Center, with 80% being cats. The Center could use volunteers, foster parents, old bedding and other animal supplies.